Look what DJ made for my birthday . . . with an encore performance for valentine’s day. 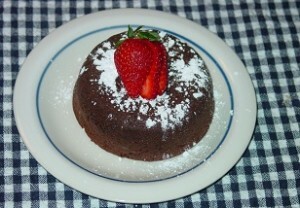 Yep, that is molten chocolate cake (aka chocolate lava cake) — made from scratch. And yes, it tasted every bit as good as it looks. 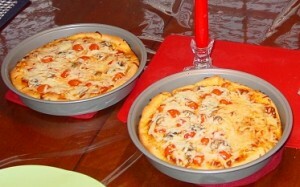 My contribution to our valentine’s dinner was a pair of pan pizzas. My cousin Tara gave me this recipe and it is hands-down the best pizza crust recipe that this carboholic has ever tasted. I apologize for the miserable weather that we had this past week. Many of you thought that the Super Bowl teams brought the arctic temps down with them. But really, it was my fault. I swore last year that I would never plant a garden again, but I did. Thursday, January 30 the sun was shining, it was 73* and Raine and I were playing out back when the offending idea popped into my head, “let’s plant some seeds.” So I pulled the leftover seeds out of the freezer and we planted them. I knew it would yield nothing but cold weather, but I did it anyway, and just look what happened. So I apologize. 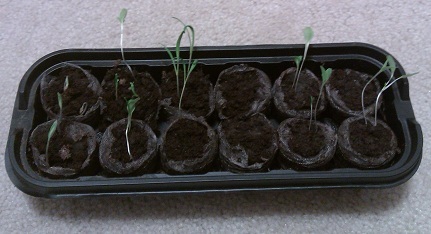 I’m not sure what the seeds we planted outside are doing, but the ones we planted inside are doing quite well. No one can say that I didn’t plant early enough to beat the heat this year!